The real danger to Venice isn't flooding, it's the destruction of brick by saltwater. The rumors that Venice is sinking are greatly exaggerated, at least for now. Yes, sea levels are rising, but there's no indication that the city will become a latter-day Atlantis in our lifetimes (or even in our children's). The immediate problem is more prosaic: As storm tides called acqua alta increase in frequency, the city's buildings and canal walls--which are mostly made of brick--are exposed to inundation by saltwater for several hours at a time. When the water recedes, it leaves wet bricks behind, and the salt slowly works its way up the brickwork. The salt corrodes the bricks, and eventually the bricks break down, turning to powder. Unfortunately, this isn't always practical, and rinsing salt water from bricks is a stopgap measure at best. Over the long haul, bricks that are attacked by saltwater succumb to rot and need to be replaced. 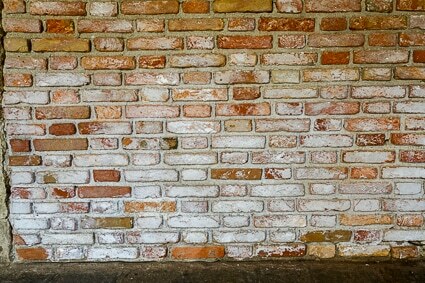 It isn't uncommon to see Venetian bricklayers chipping old, crumbling bricks out of walls and replacing them with new bricks of an identical color and design. The MOSE project (Venice's version of the Thames Barrier) is designed to minimize flooding by isolating the Venetian Lagoon from the Adriatic Sea when storm tides threaten to cover large areas of the city. This should help to reduce the impact of saltwater on brick walls away from canals and the Lagoon. However, walls along bodies of water or within flooding distance of drains will remain at risk, and not just because of acqua alta: Wakes from speedboats, water taxis, barges, and water buses will continue to erode canal walls and splash saltwater on building walls that face canals or the Lagoon. The stresses on brick walls can be reduced, but in the end, restoration--not preservation--is the only feasible solution. 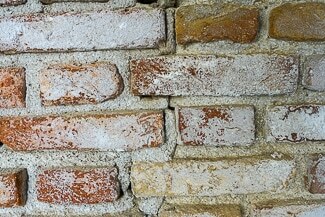 ABOVE: Salt has worked its way to the surface of bricks on a residential building on the Campiello de la Madonna in Venice's sestiere or district of Cannaregio. 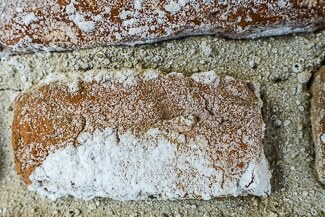 ABOVE: Salt has formed a crust on the surface of this brick. 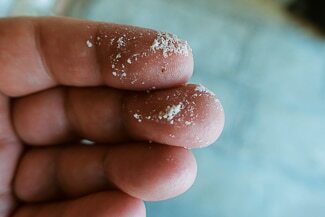 ABOVE: I sampled the salt, which had the texture of fine table salt and tasted like sea salt. 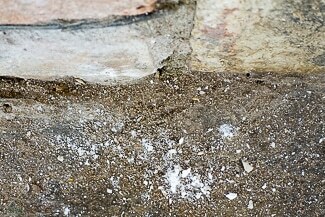 ABOVE: Some of the salt has fallen from the bricks onto the pavement. 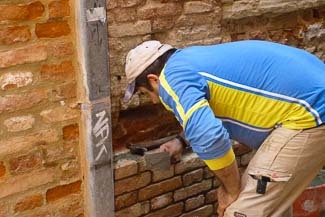 ABOVE: Bricklayers repair a crumbling wall in Venice by chipping out old bricks and replacing them with new ones. 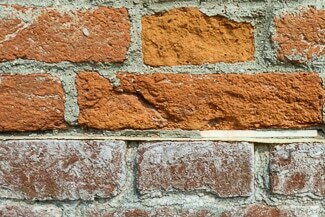 ABOVE: Here, you can see a section of new, historically accurate restoration bricks above old, salt-stained bricks. A waterproof membrane has been installed between the old and new courses to stop saltwater from migrating upward during acqua alta. Our illustrated article describes the storm tides that can flood low-lying areas of Venice for several hours at a time, especially from late fall through early spring. It includes links to forecasting sites and apps, and it tells what to expect when you hear warning sirens. 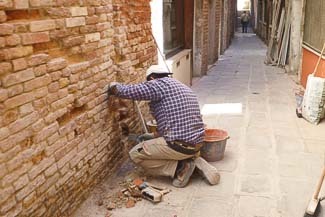 The University of Mary Washington has published an excellent discussion (with photos and diagrams) of brick and its problems in Venice.